At about same time that the American poultry industry was conducting its “Chicken of Tomorrow” experiment. Soon, the world came to know the cornish-cross, with its incredible ability to put on table weight in a fraction of the time. As a result, there no longer was as much need for dual-purpose breeds like the Ixworth and the Delaware. Soon, heritage table birds everywhere would slide on a steady decline toward obscurity. They are Light-boned, with a covering of pure white feathers. Hens lay eggs only slightly smaller than the white Sussex, usually around 64g (US extra-large), and weighed over 7lbs at maturity. The roosters fatten nicely as well, and they are proficient forager. They have a bright red pea comb and waddles and are well-suited for cold. Today the Ixworth remains on the UK’s watch list of the Rare Breed Survival Trust. In 2008, they were listed as endangered. Few people outside of England have ever seen Ixworth chickens. However, efforts are underway to help reignite interest in them. 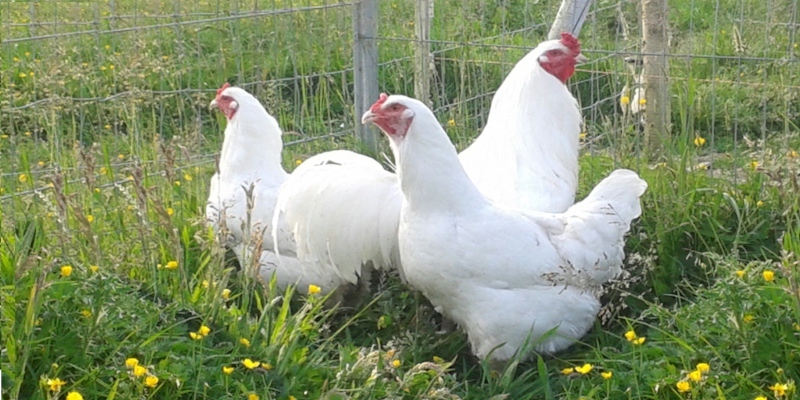 They remain an excellent breed for the small, premium poultry farm. Importantly, they are designed to do what has become popular again: keep a family in good-supply of eggs, while delivering a delicious dinner.